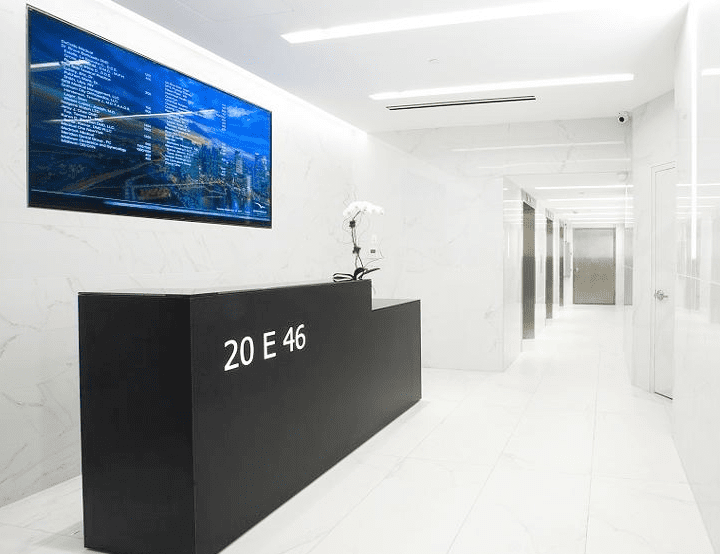 February 1, 2018 – AlivePromo’s digital directory and desk designs help bring new life to a New York City office building. AlivePromo, Inc. in Minneapolis, Minnesota, a long time leading provider of digital directories and displays for government and commercial properties, provided a state of the art digital directory and desk system for 20 E 46h St. in New York City. The project, in partnership with Architects at Lee Alto Design in New York, was a complete redo of a dated professional office building acquired by The Nightingale Group. The digital directory, a large 85” UHD 4K screen, and the guard desk, a compact modern waterfall design concept, were provided by AlivePromo in Minneapolis. The AlivePromo designed content on the beautiful ultra high definition digital director can be managed by the property staff using AlivePromo’s AlivePulse™ content management system.